Travis enjoys working hard to see that he and his team work with our clients at a personal level unmatched by any other training staff. His goal is to ensure each and every client has the best experience possible during their term with us. We have a strong passion for what we do and that is what drives results! Marcus is an avid athlete with a strong desire to help others make a difference in their overall health and fitness, be it losing weight, coming back from an injury, ailment or rehab, running their first 5K or 10th marathon, body building or just keeping physically active. It would be a privilege to help you reach your fitness goals. 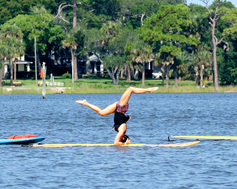 Daina was born and raised here in Ormond Beach. Her lifelong passion for fitness has brought her to Platinum to pursue a career in personal training. She started as a gymnast throughout her childhood and later became a competitive cheerleader. She feels that consistent exercise is a huge factor to overall health and physical as well as mental well being and can't wait to do what she loves and help others along the way. Coming from racing motocross for majority of his life, Dawson enjoys pushing the limits of himself and others’ abilities. After years of specialized training here at the Platinum facility to facilitate that success, Dawson now joins us as a trainer! With a passion for helping others achieve what they want and reach their full potential and more, Dawson is dedicated to helping clients achieve a healthy and happy lifestyle. Alexandrea works with people who want to know their true life purpose, people who need help remembering what's important and need reminding of how amazing they are. She’s been re-connecting people with their self-love and self-awareness for 20 years, from inspiring the inner heart with song or deep loving therapeutic conversations. As an intuitive reader, life coach, medium and meditation coach, this former Jersey girl and New Yorker traded the glitter of the Great White Way for the sacred sites of Ormond Beach, Florida. Today, her office overlooks the ancient and serene Tomoka River. With a Bachelor's of Fine Arts from the NYU Tisch School of the Arts, and having studied under venerated meditation teacher and best-selling author of The Power of Intention, Wayne Dyer she now co-owns and operates Platinum Health, Fitness & Yoga with her husband where she challenges you to begin living life in the highest consciousness, incorporating scientific fact, faith, creativity, human connection, and inner truth. When she’s not helping people raise the frequency of the human condition, she can be found reading the Harry Potter series in her backyard hammock, rocking out every high note in Celine Dion's Power Of Love Album, meditating surrounded by her collection of too many (yet never enough) stones and crystals, or eating Southern buttermilk fried chicken from her neighborhood bistro. Are you finally ready to shed the illusions of fear, confusion, and inaction? Want to know more about how you can discover your true, sacred self? Follow her journey on Instagram @missmeditation, on her Facebook Fan Page, or find out more at www.alexandrealightfoot.com and www.platinumormond.com/meditation . Like most yogis, Toni started practicing yoga to reap the physical benefits of the asana practice. Within her busy schedule, she allowed her practice to consist of one 90 minute class per week. This practice lasted for an entire year. In wasn’t until a friend encouraged her to participate in a half marathon race that her practice changed. Toni was not a running enthusiast. However, she planned 12 weeks before the race to train for this new endeavor. As a graduate student and full time teacher, she was unable to fit training into her calendar. The day of the race was a crucial day that has forever changed her practice of yoga. She was able to run the entire 13.1 miles without exhaustion and with controlled breath. She attributes her half marathon success to the practice of yoga, considering this was the most (and only) influential factor affecting her success. Her practiced has progressed into a daily asana practice, 200 hr Registered Yoga Teacher (RYT) certification, and continued education with role models Krishna Das, Rolf Gates, Briohny Kate Smyth and Dice Iida-Klein . She is passionate about assisting in the mission of healing because and believes yoga to be a healer of all ailments. In her classes she pays attention to misalignments and physical and emotional blocks. 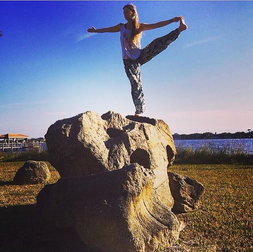 She integrates the Yoga Sutras through poetry and inspirational stories as this challenges her to learn more to share. Her passion for learning has unveiled her destiny. Toni lives in Daytona Beach where she teaches within Volusia County Public Schools. "Yoga is experience, it takes place inside, not out. And why Yoga cannot be taught in 200 hours - or even 2000 - because it's not something learned at all, but a true Self realized, over a lifetime of seeking." I am a 200 hour RYT. I am currently in training for my 500 hour RYT. I found yoga in a unique way. I like to think yoga found me. I was attending a workshop for COPE, Community Outreach for the Prevention of Eating Disorders, and they offered a free yoga class afterwards. I was an avid runner at the time, and yoga seemed like a nice way to stretch on my "days off" from running. I talked to a close friend and she recommended a local studio. This happened at a very profound turning point in my life. I was at a crossroads and I had to make a choice to keep going the way I was, or choose a different path. Yoga was life transforming for me. It is such a personal journey, there is no way to describe how it will change or effect each individual person, but in some way, it will. My training is primarily in Ashtanga yoga (a dynamic, physically demanding practice synchronizes breath and movement to produce an internal heat designed to purify the body), but I have done many workshops and classes in various yoga styles, including Hatha, Yin, Detox, and Vinyassa. We all come to yoga for various different reasons, but "practice and all is coming." as Robert Frost once said, "I took the road less traveled by, and that has made all the difference." Alexis Martin ERYT-500, is an enthusiastic truth-seeker that enjoys dark chocolate and globe-trotting. This Florida native is a human kinetic artist with a passion to open minds, warm hearts, and diminish fear. She believes in healing via a splash of sweat, belly-aching laughter, and the power of a story to change a life. When practicing yoga in her signature playful style, expect a dharma evocation intertwined with practical anatomy. Storytelling and sharing life experiences set a platform from which Alexis opens her heart & you truly meet the warm transparent spirit that lies within YOU. Insight from her own teachers intertwined with lessons from the ancient yoga texts support living a nourishing and satisfying life on and off the mat. When she’s not holding space for the enlightenment of bodies and minds somewhere, she is usually avoiding housecleaning by getting an exercise-induced endorphin fix on the mat, lounging at the beach with an umbrella decorated drink, chanting into a deep state of bliss, or stealing kisses from her husband and daughter. Practice yoga online with Alexis at www.oneoeight.com & check out her latest offerings at www.alexismartinyoga.com or @alexismartinyoga. Born a gypsy soul, movement has always been my form of self expression. Since I could walk I began dancing so practicing yoga was a natural evolution in my journey of life. Passionate about all forms of the expressive arts, creative arts, body care and self love; I completed a photography degree from Florida State University and am a licensed paramedical esthetician/body wrapper. My yoga teacher training was completed at Renew yoga studio and, to be quite honest, the entire community has raised this yogi- sometimes it takes a village. I have been incredibly fortunate to study under amazing souls such as Erica Mathers, Philip Askew, Ivy Kramer, Kirsten Adelia Collins, Kino McGregor, Karen Samuels, Michael Hayes, Matthew Sanford and the list continues to grow. As my journey with yoga comes off my mat and into life, the fire within me burns brighter to remain open, as a student of life, to learn, develop & share these gifts with my fellow students. I enjoy helping others find ways to express themselves and have a special dedication to guide others to discover peace within their own bodies, and to listen to their personal needs. My mission is to provide a comfortable, accepting space for yogis at all levels to practice, learn, support and inspire. Yoga has been a vital part in my own personal journey to recovery on this life path and my purpose in life is now to give what was given to me......love&light. Sherri Meyers is faith-filled, an athlete, artist, business owner, & forever a student. ​With 20 years of practice- Sherri has received an additional Yin Yoga certification with Tymi Howard she also has taken specialty workshops with Kerri Verna, Dylan Werner, Briohny (Bri) & Dice, Philip & Ivy Askew, Garth Hewitt, Alexis Martin, and Kelli Durrance- to name a few of her renown teachers. Sherri's classes are built around correct form, stretching and strengthening. They move at a slower pace with some intensity. Great for all levels. Before Yoga: Dancer, Aerobics Instructor (back in the day), runner, strength training which she continues today. Join her on your mat Thursday’s at 6:00 or she is available for private sessions. ​Melissa Smith's love for yoga started in 2006 when she experienced the powerful effects of feeling peace, strength, grace and flexibility both physically and mentally from her yoga practice. Those effects were immediate, and with time it also became a spiritual practice. She enjoys all styles of yoga, but has recently been more drawn to a yin practice. Yin yoga works the connective tissue around the major joints of the body to enhance the flow of energy. Her objective is to guide yoga students into a practice in which they can connect to themselves by calming their mind and dropping into their hearts to allow for an internal journey of self discovery. She incorporates the 3 aspects of yoga in every class : asana (postures), pranayama (breath work) and meditation. Check out her class at 6 pm on Wednesdays. Jennifer Sullivan was born and raised in Australia. As a young woman she had a Spiritual calling. She traveled to India in the late seventies. While in India she studied Shiatsu, Massage, Meditation, Yoga and Eastern Philosophy while living and working in several Spiritual Communities. Jennifer later went on to Complete Certifications in Massage, Life Coaching, Personal Fitness Training and Hatha Yoga. Her true passion is helping others to find their inner peace and happiness. She believes Yoga is a perfect vehicle for connection and self-expression. She designs each yoga class to reflect her fellow yogi’s motivation, goals and aspirations. Jennifer’s Hatha style of Yoga is gentle, focusing on breath work, proper alignment, strength building and deep relaxation. Meditation is a key part of her teachings. A guided meditation at the end of a yoga practice supports a deep sense of wellbeing. Teaching to a variety of age groups over the years, from 4 years to Senior Citizens, has shown her that just because one is younger does not mean one is flexible. Jennifer looks forward to seeing you on your mat……. In 2001, while living in Mexico, Carole noticed a sign for yoga classes on the wall of a local market. She arrived at the address and followed a path through a beautiful garden that led to a thatched-roof hut where a group of women were sitting in a circle on the ground. Between the Sanskrit and Spanish, Carole had no idea what the teacher was saying but she joined in, watched their movements, listened to their breathing and at some point it didn’t matter anymore that she couldn’t understand the words. The whole experience began to make intuitive sense to her body, mind and spirit, and she has been a student of yoga ever since. Carole’s calling to yoga led her to practice many forms of the discipline over the years, which developed further into a lifestyle. She credits yoga with introducing her to cherished friends and carrying her through the life challenge of grief. She is a 200 Hour-certified Registered Yoga Teacher (RYT) in the Kripalu tradition. Her classes are theme-focused so that each one is a little different but also incorporates foundational postures for students to notice their own developmental progress. She uses meditation, visualization, inspirational readings and breath work. Carole is originally from Virginia, loves to grow orchids, cook and engage in festivities with family and friends. She also owns an event planning and hospitality business in the sports car racing industry. Growing up with a background in ballet, I have always been fascinated by the language of the body. After retiring from dance, gaining a career, and having children I realized that I had somehow lost my normal workout routine. I was searching for some sort of physical regime and my first introduction to yoga came as a need for fitness and stress relief. Shortly after my first class, I was hooked. It wasn't until I completed a 21 day challenge that I started to realize the impact yoga would have on my life. From that day on, I knew I had to make it a daily practice. I look forward to learning, growing and receiving alongside my fellow students on this journey we call yoga. My hopes as a teacher are to establish a warm and open environment where students feel safe, connected, and present throughout their practice. Aside from my love of yoga, I am passionate about snowboarding, all forms of dance, practicing kindness, and of course, being a wife and mother. ​For as long as I can remember I have been motivated by my appreciation for sports, a healthy diet and a happy and active lifestyle. After earning my Masters Degree in Sports and Nutrition, along with many other various physical education trainings- I arrived at a passion for yoga. Yoga is a an all-encompassing healthy lifestyle, that is obtainable for everyone. With yoga movements come a healthy diet, which is known as Ayurveda. I love the principals embraced by this ancient Eastern Indian diet, as they are deeply connected to the very same healthy principals of yoga. For me personally, a combination of yoga practice paired with Ayurveda knowledge has made me a happy and healthy little yogini. I wish to share my journey and insight with all people on my path. Together, let’s understand our body, read our mind and free our spirit. ​I found yoga in 2009 after years of struggling with anxiety and joint pain. To be quite honest, I did not like it at first. Yoga hurt and felt awkward; not to mention I had no idea what I was doing. In time (and with lots of practice) I fell in love with what I now know yoga to be: union with all things, loving kindness, ease, strength, surrender, passion, and inner exploration. In 2013 I decided I wanted to begin sharing this love I found, so I took an opportunity in Anchorage, Alaska to practice many hours of yoga (accompanied by many hours of solitude) and save money for my hopeful future. In October that year I completed the Still Flowing Yoga Teacher Training in Ibiza, Spain and became nationally certified to instruct yoga asana. Yoga has shown me how to be a more flexible, patient, still, mindful, compassionate, and loving human being. My intention is to help guide you on your journey and share the lifelong practice of yoga on and off the mat to find that sweet connection between breathe, body, mind and soul.